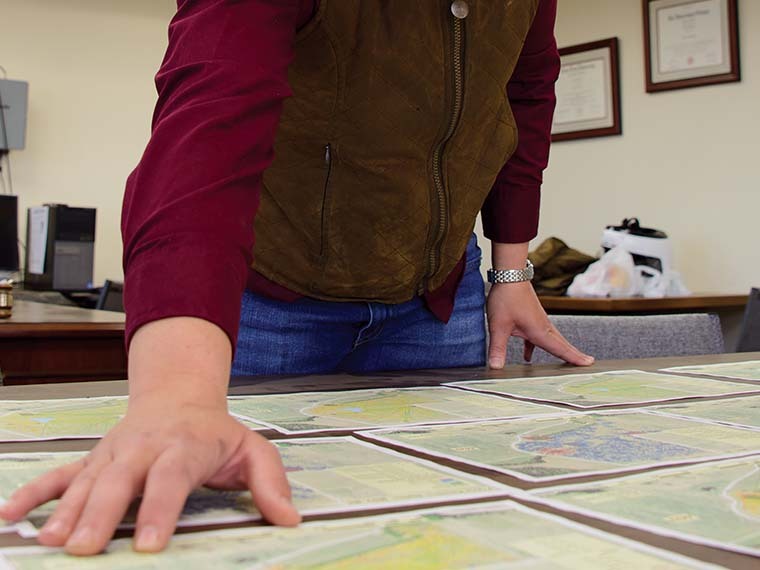 Dr. Jane Parish examines maps generated from the datasets produced from cows wearing GPS collars. Photo by David Ammon. Mississippi is home to almost one million grazing cattle statewide with more than 16,000 producers managing herds in the Magnolia State. In the future, cattle producers may be able to use GPS at the field level. Mississippi State University scientists are leveraging geospatial technology in a research environment today in order to learn more about beef cattle movement and behavior. Researchers at the Prairie Research Unit in the Mississippi Agricultural and Forestry Experiment Station are using GPS to study heat tolerance in red and black Angus cows. Dr. Jane Parish, research and extension professor leads the work. “Each cow wears a GPS collar that collects data every five minutes. The collars tell us about the movement and behavior of the individual cows,” Parish said. Data were collected on 16 heifers as they grazed on toxic tall fescue in the hot summer sun; eight cows were red and eight were black. The collars recorded their movements to and from a fresh water pond, a fresh water trough, and shade cover. Ultimately, the data suggested that the red cattle behaved quite differently than the black cattle and led to additional questions about what is driving the behavioral differences. After the data were collected, Parish turned to Dr. Amelia Fox, an expert in geospatial mapping, to help analyze the data. Fox is a visiting scholar as part of the MSU Precision Agriculture Initiative in the College of Agriculture and Life Sciences. “I brought Jane’s datasets into a Getis-Ord Gi* mapping environment, which produces outcomes that are visually-driven and simple to perceive,” Fox said. Fox’s maps illustrated distinct differences between the behavior of the red and black cows. , indicating the red cattle used the shade and water features with greater efficiency. Fox said the mapping technology provides quick and easy insight that tells the story of large datasets in an approachable, user-friendly manner. 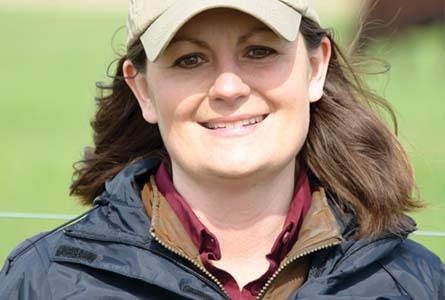 Parish said she sees GPS and mapping technology being used by the industry at some point in the future. “I think, down the line, cattle producers will use precision agriculture technology to better understand and manage the behavior and well-being of their herds,” Parish said. Future projects using the GPS collars at the Prairie Research Unit include a grazing preference study in the early summer and a late-gestational behavior study of pregnant cattle in late summer/early fall.